Rooibos is a plant native to South Africa; its name translates from Afrikaans to English literally as “red bush.” It has a sweet, nutty flavor. In addition to using the plant as a drink and tea, it is also used for cooking and baking, and in some cosmetics to promote healthy skin. Africans have used rooibos for centuries—the plant contains high amounts of antioxidants and minerals, including iron, calcium, zinc, and magnesium. Rooibos is also effective in treating skin ailments. Recent studies have shown that because of rooibos’ high levels of zinc, alpha-hydroxy, and superoxide dismutases, it’s a particularly effective treatment for acne both when taken orally and applied topically. 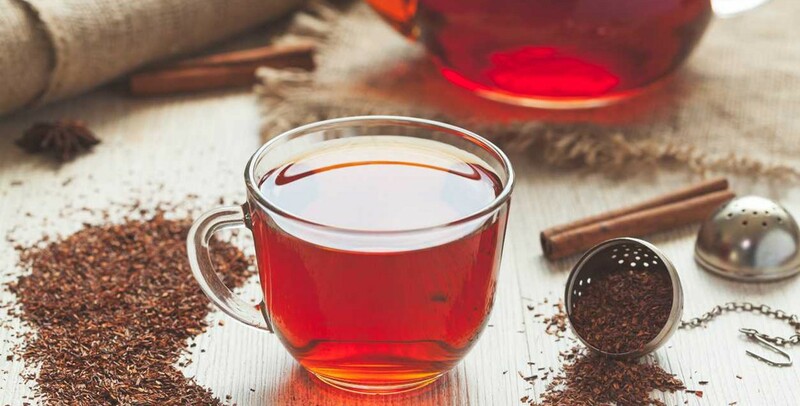 Rooibos is also known for its calming properties to help promote relaxation and a good night’s sleep, but it won’t make you drowsy during the day. People with liver or kidney disease should speak with their doctor before drinking rooibos due to the possibility of further organ damage. People who are being treated for cancer should also consult their healthcare professional before using rooibos tea because certain antioxidants found in the herb may interfere with chemotherapy drugs. Steep 1 to 2 teaspoons of loose leaf rooibos tea per cup for 2 to 4 minutes. If you prefer tea bags, use 1 bag per cup.